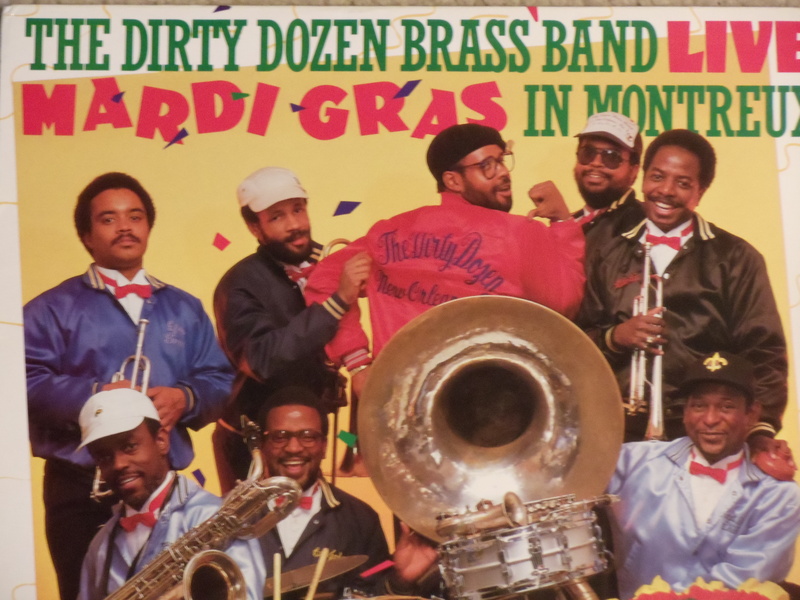 When the Dirty Dozen Brass Band was formed in 1977, the market for brass band music was fairly moribund. Paying gigs were few and far between. Consequently, they got together as a rehearsal group, just to play music that interested them, including bebop, jazz standards, and funk, which were far from the repertoire of traditional brass bands. They started getting requests to play in parades for some of New Orlean’s Social and Pleasure Clubs, and were embraced by the marching community, though their music was often very uptempo for a brass band, with rapid fire ensemble blowing, incendiary solos, and a rollicking, joyful sound. Heck, they did the theme from The Flintstones. Second liners had to pick up the pace of their dancing/marching, but they liked it. Weekly gigs in clubs within the Seventh Ward and Uptown helped their popularity grow, and in 1980, the Dozen caught the ear of WWOZ, a new community radio station, which helped promote them within the city. When promoter George Wein heard them in 1984, he booked them into international festivals, long engagements in New York and recorded them on My Feet Can’t Fail Me Now. Some thirty-four years later, the band has played at all kinds of festivals, and recorded with a plethora of acts, from jambands to indie groups and hip-hop artists. The Dozen were instrumental in inspiring other young brass bands, which are found throughout New Orleans these days. Five of the original eight members are still at it, with a guitarist and drummer on a trap set. A 25th Anniversary edition of My Feet Can’t Fail Me Now has been released, and the band is touring in its support. I talked with Roger Lewis (baritone sax) by phone from the tour bus on March 5th, 2011. They were making their way to Minneapolis for an engagement at the Dakota Jazz Club and Restaurant. The connection, on a cell phone in a traveling bus, was a bit rough, so this is a slightly edited version of the interview. Roger Lewis: Yeah, Feets Can’t Fail Me Now. LE: Roger, you were involved with the first recording, and early on with the band. How did the band get started? RL: Well, we started out playing second line parades with different marching clubs and social and pleasure clubs in New Orleans, and I think the band started with Benny Jones, and then we decided we had all these gigs and we’d come together and try to make something happen musically. In the early days we weren’t really rehearsing, we just would get together just playing some music. So Gregory Davis, Kevin Harris, Efrem Towns, Kirk Joseph, Charles Joseph, Lionel Batiste, Janell Marshall – we’d rehearse at at Kirk Joseph father’s house, Waldren Joseph, a very famous trombonist. Playing the kind of music we wanted to play. Of course also playing traditional music of New Orleans. So we just started playing music of Duke Ellington and Thelonious Monk, Horace Silver and Michael Jackson, anybody else, creating our own compositions, and we brought this music to the street, kind of picked the beat up a little bit. Made it a little fonky, you know and people started dancing to this music. RL: The list goes on and on. Elvis Costello, we did a couple of records with him. LE: It’s my understanding that when you started, some of the gentlemen that started it had been students of Danny Barker. LE: You had played professionally prior to joining the group. RL: Oh yeah, I was playing with Fats Domino at the time. I’m the oldest member of the band. LE: When you started doing second lines, the band was pretty revolutionary, doing songs of Duke Ellington and Charlie Parker, things like that. RL: Yeah, the music of New Orleans is so powerful and so rhythmic, it’s so spiritual, you’ve got to do something. It’s music for your mind, body, and soul. All three things. You’ve got to move with the groove. LE: Here in the Twin Cities at the Guthrie you also had people up and dancing, and it’s a pretty staid place. LE: As you’ve progressed, you’ve gone through different membership and have tried different combinations. What kind of group is touring now? How many people are in it? RL: Yeah, a little different flavor to the music. We still play the same things we’ve always played, and have added a couple of new things. LE: What kind of music are you adding to your repertoire these days? RL: Pretty much basically a variety of different styles. We don’t play just one style of music. We play anything from avant-garde bebop to funk, you name it. You might hear anything and everything in our music. LE: Are we going to have some marching around the club? RL: We don’t know. Depends on how the groove is. We know for sure we’ll shake up the house at the end, get the ladies up and everybody rockin’ and rollin’ and makin’ em do all kinds of exotic things. We’re a party band, what can I say. LE: Thanks so very much for calling in. We look forward to seeing you at the Dakota. This entry was posted on Saturday, March 12th, 2011 at 4:43 pm and is filed under Interviews. You can follow any responses to this entry through the RSS 2.0 feed. You can leave a response, or trackback from your own site.